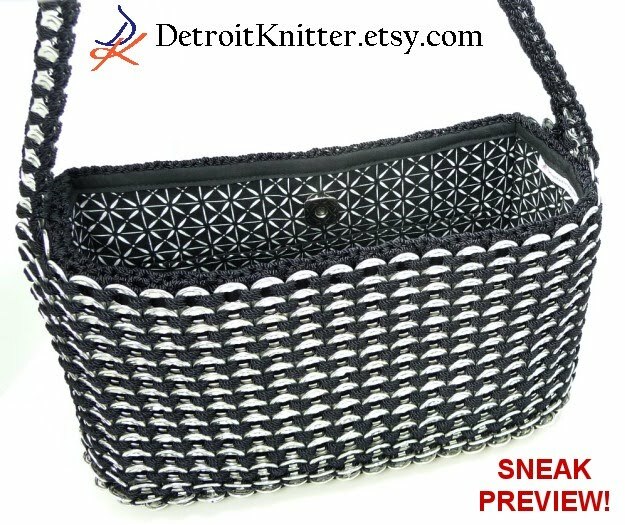 DetroitKnitter: Sneak Preview - Tab Purse! Sneak Preview - Tab Purse! SNEAK PREVIEW! I just finished this handmade tab purse yesterday and it's not yet listed. It is constructed of 838 tabs and over 200 yards of nylon cord. It features a sturdy side and bottom construction allowing maintain its upright shape while still being flexible. The bag features a silver magnet snap enclosure, 2 interior pockets and a geometric cotton lining. Gift wrapping and gift cards are available for free upon request. This handbag will be priced at $110. The Sneak Preview discount is 10%. Shipping is $6 and is not discounted. 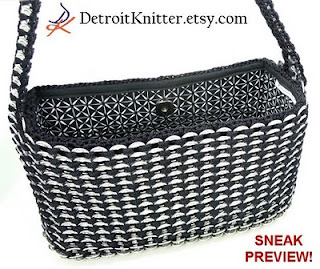 Interested parties should contact me at DetroitKnitter@hotmail.com! This purse will be listed for sale on Monday, July 19, 2010 at which time the 10% Sneak Preview offer ends. Additional photos are available. Custom orders are welcome. My other handmade items can be found at my shop, DetroitKnitter.Etsy.com. One of these days perhaps I'll do a tutorial on how to make a pop tab purse!